Middle Township’s girls swimming team after clinching the program’s first CAL National Conference title. Pictured are: front row, kneeling – Julia Risko, Abby Ridgway, Jada Nagle, Ronni Johnson, Baylee Pelouze, Lucy Rowe, Maddie Deane, Bridget Donohue; front row, standing – coach DeDe Bosacco, Cara Stehman; middle row – Sarah Hughes, Reese Canter, Bethany Branco, Elizabeth Shalick, Kailyn Jamison, Sophia Braun, Grace Tomlin, Chloe Brickel, Sirena Wen, Natali Ilieva, Ashley Ohntrup, Julia Mallett, Ishika Patel, Samantha Braun, Elaina Nelson; top row – coach Tadhg Campbell, Shea Gerhard, Summer Lord, Catherine Bostard, Sophia Bosacco. Middle Township High School’s girls swimming team made history late last week. 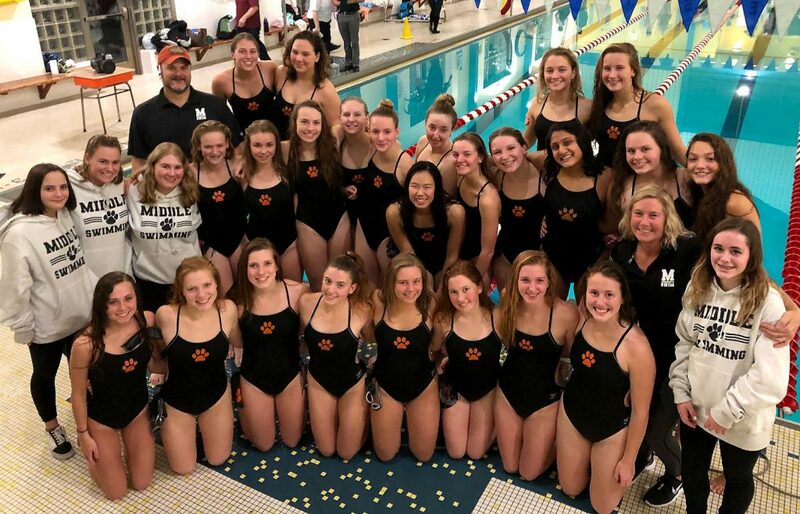 The Lady Panthers became the first swimming team from Middle — boys or girls — to win a championship of any kind when they beat Oakcrest, 105-65, on Friday to clinch the Cape-Atlantic National Conference title. Ishika Patel was part of three first-place finishes for Middle in the win. Individually, she won the 50 freestyle and 100 butterfly, while Bosacco claimed first in the 100 backstroke. Patel also joined Sophia Braun, Samantha Braun and Catherine Bostard for first place in the 200 freestyle relay. Braun (100 freestyle), Sophia Bosacco (100 backstroke) and Bridget Donohue (500 freestyle) also won individual events for Middle. Bosacco, Bostard Donohue and Maddie Deane also joined forces for first place in the 400 freestyle relay. Middle is set to finish its regular season this week with meets at Mainland Wednesday and at home against Our Lady of Mercy Academy on Friday. The team is in good position to qualify for the South Jersey playoffs.